I have pretty much forsaken trying to keep up on beer events around town--there's just too many. (Both Brewpublic, which has a left-column "events calendar," and the Brewers Guild do a great job, anyway.) However! One of the things I most appreciate is brewer generosity, so I wanted to highlight a very worthy event coming up just two days. It's a Brew-off with Laurelwood, Lompoc, Hopworks, Full Sail, and Everybody's Brewing. Join us for a tasting of each beer and vote on your favorite. Five tastes for $5.00 and all proceeds go to the American Cancer Society and the fight against breast cancer. The winning brew will be announced at the Strides against Breast Cancer walk with over 5000 participants. Stick around after the competition for local band Sugarcane at 10pm! In case you didn't read closely, 100% of the proceeds go to the American Cancer Society. Kudos to EastBurn and the participating breweries. Very cool. This is a truly historic document: the first known use of the expression India Pale Ale. It comes from an advertisement in the Liverpool Mercury newspaper published January 30 1835, a remarkably long time after pale ale started being sold in India... The Liverpool Mercury ad has several points to note, apart from the first use of the phrase India Pale Ale, quite possibly a century or more after pale ale was first exported to India. Martyn's complaint has always seemed to have less to do with beer than epistemology. He seems irritated not that a pale, hoppy, strong ale might have been shipped to India by Hodgson's in the early 1700s (to be drunk by, say, one of my favorite Indologists, the romantic William Jones), but that such an idea should be accepted as fact, when even a blind man can see that the evidence just doesn't support it. Fair enough. What I took away from Martyn's dissertation was something related, and it seems to be the thing that almost inevitably emerges when you look into the history of a beer style: they change. Especially here in the new world, where we're new to beer, we like to fix things in place: a Belgian wit is a summery wheat ale spiced with coriander, orange peel, and (at the brewer's discretion) other spices. It should be brewed near about 5% alcohol. This is its nature. The beers were refreshing, both brewed and consumed at a time when summer brewing was the exception. They were made with winter barley (high in protein) and raw wheat, which, considering the season, meant they would have been infected. According to the author Adolphe Frentz, that proved to be an asset because it allowed the white beers to compete against the bieres de garde and Bavarian lagers not yet mature enough to drink. In 1948 brewing scientist Jen De Clerck found all three [extant examples from the time] always heavily infected with Lactobacillus and sometimes with Pediococcus. Beer styles writhe and mutate, and in order to make sense of them, we allow our memory to become fixed. Isn't this the way of things? It's good that folks like Martyn and Stan remind us that what we think we know isn't the same thing as what is. A bit liberating, really. And I wonder, in three hundred years, what will humans be brewing, and what kind of wild misconceptions will they hold about what we brewed now, at the dawn of the 21st Century? Last night, Upright held a press event at the brewery to celebrate their first anniversary and launch of two celebratory beers. (Reviews to come.) Press events, for those of you who haven't had the pleasure, generally follow a pretty standard script: a pour of beer upon arrival, a tour of the brewery and subsequent pours, and all the while Q&A as thin gs progress. I find that the questions generally elicit the most fascinating information, and so it was last night, when Upright's Alex Ganum talked about how finicky his yeast is. Alex uses a French farmhouse yeast strain, and these are notoriously difficult to work with. The most famous, and famously difficult, is Dupont's, which requires high fermentation temperatures (over 85 degrees; regular yeasts do better below 70) and then craps out before it's fully done, requiring a brewery to nurture and coax it along for days or weeks. Alex's isn't as bad, but it bears some of these hallmarks. He ferments it in the mid-70s, and then has to wait while it meanders along--sometimes for three weeks in the open primary fermenters. Other yeasts would take less than a week. But even then, the fun's not over. Once it goes into the tank, the beer keeps evolving. Alex knew the yeast was efficient even a year ago when I first visited the brewery; it's attenuation was on of the attractions. After a year of working with the beer, though, he's started to realize that it may be too much of a good thing. Because those yeasts keep munching, he can't bottle or keg for a long while without worry of foamy pints or explosive bottles. He prevailed on the Widmers to do a lab analysis for him (which they happily did, and gratis, contrary to the suspicion some hold that they wish to crush the competition) and the results were shocking. Upright's beer was reaching levels of attenuation in the mid-90s, sometimes as high as 97%. Yeast consume the sugar in wort, and turn that sugar into CO2, alcohol, and flavor compounds. When yeast finish the fermentation process, they shut down, clump together, and fall to the bottom of the fermentor, or "flocculate." When yeast flocculate, it is easy to see that fermentation is done. But how can the brewer be sure? What if the flocculation is minimal, and yeast and CO2 stay in solution. How does the brewer really know when fermentation is done? The answer: by testing the degree of attenuation. Apparent attenuation percentage is the percentage of sugars that yeast consume. Attenuation varies between different strains. 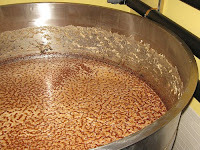 The fermentation conditions and gravity of a particular beer will cause the attenuation to vary, hence each strain of brewers yeast has a characteristic attenuation range. The range for brewers yeast is typically between 65-85%. 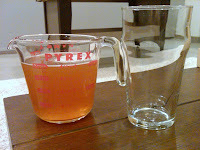 Typical ale yeasts are comparatively inefficient. The kinds of beers most appreciated in Beervana will have an attenuation of around 70%, give or take. Lager strains are roughly the same. Most Belgian strains--wild yeast excepted--are more attenuative, but still, few get out of the high 70s. So, a beer with an apparent attenuation of 97% would have almost no residual sugars. Alex's yeast is the Energizer bunny--it just keeps going. As a homebrewer and craft beer fan, I find this charming. So farmhousey! But I imagine it's driving Upright crazy. For one thing, it costs a lot of money to let beer just sit in a tank. If it takes a beer twice as long to finish fermenting, a brewery can only produce half as much beer per tank. Beyond that, Upright can't risk letting any beer but the most bone-dry out of the brewery for fear that it will continue to ferment in kegs and bottles. From a business perspective, you want predictable and fast, not idiosyncratic and farmhousey. Charming is not a prized characteristic in the behavior of yeasts. On the other hand, the yeast produces some amazing beer. The Four Play, in particular, really benefits from this strain, for reasons I'll mention in my future review. Most beers with this kind of attenuation would taste thin and bone dry, but somehow the production of esters counteracts the dryness. And how the beer remains creamy and silky--never thin--is a mystery to me. Chemists out there, please weigh in. When Alex founded Upright, he wanted the beer to be marked by the character of the yeast and the qualities of farmhouse brewing--local ingredients, handmade beer, idiosyncratic styles, and a flavorful rusticity. A year in and he and co-brewer Gerritt Ill have managed to pull this off. I wonder if sometimes they feel this yeast is punishing them for their success. Ah brewing! A guy named Tony Yanow is opening a new pub in Burbank that sounds like it was transported directly from Southeast Portland. Great beer, great food, sustainable, and vegan-friendly. (The vegan sausages are even imported from the NW!) The planned opening is April 4. Tony did the measuring backward, and he will send me one from an obvious place in the pub once the pub is open, so for now the two photos I have are provisional. But he wanted to promote honest pints for his opening, and so we're bending the rules a bit to get him certified before the place opens. If you're down in Southern California, stop in and have a pint. Looks like a cool place. Goose Island is, in craft brewing terms, an old-timer. Good beer arrived later to the Midwest, so when Goose Island set up shop in Chicago in 1988, it was a pioneer. Despite its early founding, it was hamper ed by Midwest palates that still considered Grain Belt a decent beer. I was dimly aware of it when I arrived in Wisconsin a few years later, but the Badger state breweries were already leading the way (New Glarus and Sprecher were standouts). A friend of mine referred to Goose Island's beer as "swamp water." Things have changed. Chicago's beer palate has grown up, and Goose Island has become a brewery associated--at least nationally--with its Belgian and barrel-aged offerings. Bourbon County Stout has been available on the West Coast for awhile, and now Goose Island is rolling out their Belgian line. This is an interesting moment in the development of craft beer. For years breweries just toyed with Belgian styles, but now a few are actively seeking a market for them--in front of demand, as far as I can tell. Consumers still seem enamored of big, burly American ales (hoppy or black and barrel aged); Belgian styles still command only a niche audience. Yet with this expansion of their Belgians, Goose Island is gambling that the niche will grow and that they'll be first in line. A trend to watch. First up is Matilda, which the brewery was kind enough to send my way. Although the brewery calls it a "Belgian style pale ale," Orval is the inspiration for Matilda. If you recall, a legend animates the Abbaye Notre-Dame d'Orval. The story holds that a young countess was sitting beside a spring near where the monastery is located. Her wedding ring fell off; distraught, she prayed until a trout appeared, ring in mouth. The countess' name? Matilda. If the monastery's name is an homage to this legend, then Goose Island's Matilda is an homage to Orval. Their version, like Orval's, is made with pale and caramel malts, is both fairly hoppy (32 IBU) and similarly-hopped (both use Styrian Goldings, Goose Island substituting Saaz for Hersbrucker), and both use sugar to enhance the alcohol without adding body. Orval, famously, employs multiple yeast strains--a regular ale yeast in primary fermentation, and then a blend of yeasts for secondary that includes brettanomyces. And apparently, so does Matilda. Or did, anyway--more on that presently. Owing to the brett, Orval has variable strength depending on age--6-7%. Matilda is 7%. As you can see from the photo, Matilda approximates Orval in color as well--though it's less orange and more copper. 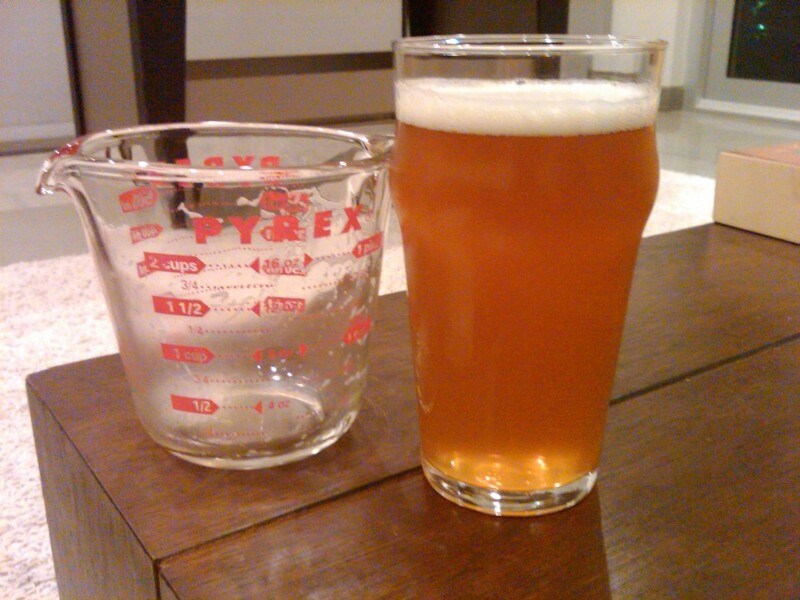 The head on my pour wasn't tall and fluffy like this, though--I got just a skiff. The nose is alcoholic and a touch phenolic, with a slight clove note and just a (pleasant) hint of sulfur. It is much as one would expect from a fortified Belgian. I was surprised at how thin the body was. The sweetish sugar-alcohol note is contrasted nicely by a very dry finish. There's a bit of spice on the palate, but not a lot. 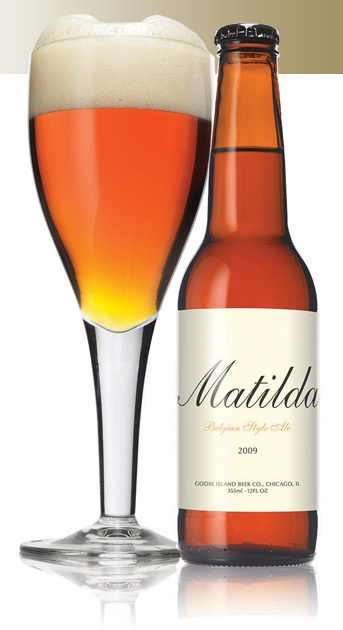 With beers like this, I hope for some layered complexity, but Matilda is straightforward: gentle, alcoholic, dry. All of this comes with a caveat. If the brewery still uses brettanomcyes, it hasn't had a chance to express itself in this young 2010 vintage. I found absolutely no evidence in my bottle. This may well be intentional: young Orval is principally hoppy and wet; but once the brett starts to munch sugars in the bottle, it matures until it is bone dry, lemony, austere. 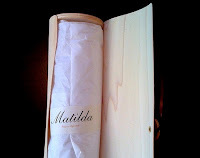 Perhaps Matilda is designed to change with age, too. Because Matilda is inspired by and apparently modeled on Orval, it's impossible not to compare the two, and this is not to Goose Island's advantage. Orval is easily one of the best beers in the world (I'd put it in the top five). 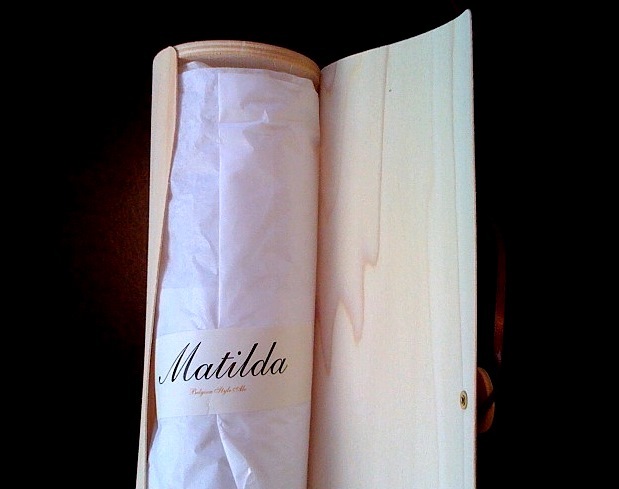 Matilda, while pleasant and enjoyable, is not particularly distinctive. It seems a bit like what it is--an early example of a transplanted style being brewed in a new country. A respectable outing, but not a home run. Availability: Newly available on the West Coast. 12-ounce 4-pack $11-14. I don't actually get (or solicit) much in the way of promotional samples. I know from reading Jon's blog that breweries regularly include wowza packaging when they send these to reviewers. Cardboad boxes, okay. Even wooden boxes, not surprisng. But check out Goose Island's packaging. It's a wooden box, but the wood is cut thin and rolled like parchment, sealed with a leather strap. Two photos below try to capture it. Packaging is usually meant to send certain messages about brand or product, but damned if I know what to make of this. Yesterday afternoon, I was the guest on what ultimately proved to be a doomed broadcast of Savor PDX. Devlyn, the host, informed me this morning that our half-hour discussion was scuttled by digital gremlins. Ah well. However, during our discussion, we talked briefly about how being poor is no excuse for drinking bad beer. 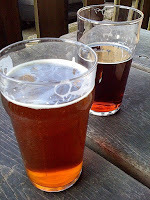 (Most of us are poor at the start of our beer-drinking careers, just at the moment when good beer may be most critical.) I mentioned that it only required you to be clever. Of course, one option is the two-dollar pint at EastBurn every Tuesday. Great beer, amazing price. By chance, after that interview, I joined a friend at Fire on the Mountain, a wings place just a few doors down from EastBurn. As a (poor) vegetarian and someone who finds chicken wings gristly and meager, I had never had occasion to stop in. And thus did I miss an amazing deal. Six dollar pitchers! The tap list is nothing to sniff at, either: Double Mountain, Hopworks, Ninkasi, Terminal Gravity, and more. So that takes care of Monday and Tuesday. Where would an enterprising beer drinker, long on smarts but short on cash, go on other nights? Suggestions? In a stealth campaign, Alan Sprints has noted that Hair of the Dog is on the move. Hair of the Dog Brewing company is moving. I will be open this May and will have a tasting room with a small food menu and regular hours. The new space is very close to downtown Portland and will provide Beer lovers with a chance to taste Beers still in the experimental stage. For regular updates, check out the Hair of the Dog Brewing facebook page. Based on activity on the Facebook page, everyone but me knew about this. There's even a video! Other interesting facts. FredFest, a May event, is slated for the new place. Also, no Earth Day sale this year. Hat tip to the indispensable Beer News. 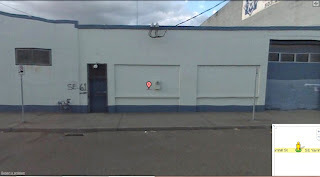 Update: Wily Elijah has identified the location of location of the new place: 61 SE Yamhill. Below is a screencap from Google Maps. Nik Antona, the Burton-based national director of the Campaign For Real Ale, said the Government’s ‘12-point plan’ to help the pub industry would help stem the flow of an alarming trend which sees 40 pubs close across the U K each week. The measures, announced by pubs minister John Healey, include plans to pump cash into allowing communities to buy out struggling pubs. Meanwhile, councils will be given new powers enabling them to intervene before pubs are demolished while pub companies will be stopped from imposing ‘restrictive covenants’ when they sell off premises, preventing competitors from continuing to run them as pubs. Alcohol laws are very often byzantine, and I'll confess that from this great distance, I don't always grasp the subtleties. But this pub crisis has been ongoing for years, and I've been following it with interest/alarm. (For a visceral sense of loss, have a look at these photos.) Hope this is a viable solution. So instead, I use that time-honored cheat, pointing you to good content elsewhere. Bill offers the third installment of the Beer Price Index. Upshot? Not a lot of movement in the aggregate, but this masks interesting changes. John Foyston in a long article about Cascade and their new barrel house. Derek reviews two Mikkeller single-hop beers, reminding me that I was going to brew a single hopped pale for Spring with those cheap Nuggets I picked up. Roots is five years old, celebration tonight. Ezra, who has done artwork for the brewery, offers comments. Angelo discusses how in just four short years Ninkasi has become the seventh largest brewery in the state. All-grain brewing versus extract: Jon has a comparison. Oakshire brewer Matt Van Wyk weighs in on the Black IPA versus Cascadian Dark Ale debate. I learned last night that BridgePort plans to discontinue its venerable Black Strap Stout. In one way, I'm surprised it survived this long. When the brewery first released the beer something like a decade an a half ago, it tasted more like stout-tinged molasses. Trying to drink a whole bottle was a rugged test of will. Even when brewers dialed back the recipe, the molasses still contributed a distinctive note--and not one of my favorites. With so many stouts available, BridgePort's always got lost in the crowd--this odd duck at the end of BridgePort's line. Black Strap Stout was never a big seller, but it must have had a loyal audience to survive this long. These things happen. Beers come and go. (And who knows--maybe the stout will enjoy a revival.) In any case, go grab a pint if you want to have a final taste before it passes this world. Two things happened today that require us to set aside our focus on beer. The first is that Alex Chilton has died. He will be less familiar to most folks than names of the stars he inspired--REM, the Replacements, Wilco and more. He was famous by the time he was sixteen and singing for the Box Tops, but his real contribution was with the 70s band Big Star. RIP, Alex. Second, one of the two best sporting events in the world kicked off today--the NCAA basketball tournament (the other is the World Cup, for similar reasons). It is especially noteworthy this year, for tomorrow my alma mater Wisconsin begins their inevitable march to the title. The other games may be interesting, too. So, for Memphis native Alex Chilton, have a shot of Jack Daniels. And in tribute to the Badgers, select your favorite beer from that famous brewing state--I recommend New Glarus' Wisconsin Belgian Red if you happen to have one handy. 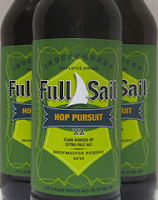 In a wonderful moment of serendipity, last night's beer was Full Sail's latest Brewmaster's Reserve, Hop Pursuit. The night before, I had a Hop Henge (everyone who thinks there should be a moratorium on beers with the word "hop" in the title, raise your hand), which led me on a slightly protracted ramble about how hops may actually reduce the perception of bitterness. As the day wore on, my thesis seemed progressively more thin to me, but I was saved by the Hop Pursuit. In the world of doubles and imperials, this is a bit of a throwback beer. (A throwback from, you know, 1998.) It is a modest 6%, sunflower pale, and in-your-face bitter. Some many moons back, Full Sail did a seasonal called Equinox ESB, a beer that actually set my expectations for a spring seasonal. It was vividly and greenly hoppy, resinous, almost too much. I loved it. Hop Pursuit has that same bracing quality, like a sneaker gust of wind that contains a bit of winter's bite. Yet it is only 55 IBUs. They all come through on the first swallow, and rake the tongue as they exit the mouth, leaving you smacking and smiling. It's not a particularly complex beer--biscuity sweetness in the body, just enough to support the piney, sharp hops. But it's a beer that makes you smile with recognition--this, you think, is a classic Northwest beer. Once again, I am confronted with the prospect of rating this beer highly. 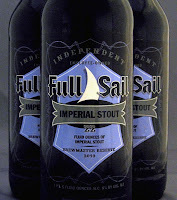 I don't know any brewery that turns out so many consistently above average beers as Full Sail. Call this a B+. 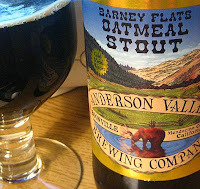 This is huge news: Anderson Valley can lay claim to being one of the most consistently high-quality breweries in America over the past 20 years. Will HMB Holdings regard it with the same loving tenderness as Ken Allen? Let's hope so. Hopworks for promoting two-wheeled, people-powered transport. I know this only scratches the surface. We should all be hoisting green beer tonight, so who'd I miss? Last week, I pointed to numbers from the Brewers Association showing that, yet again, craft breweries grew in 2009. But you know, damn lies and statistics. I shot off an email to Brian Butenschoen, director of the Oregon Brewers Guild, to get a sense of what these numbers mean. He said that in 2008--the last years for which he has numbers, Oregon craft breweries produced 912,000 barrels. That was 10.7% of the entire production of the annual total for that year. Cool, right? 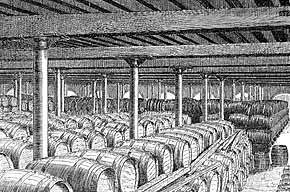 But then it occurred to me: Boston Beer brews nearly 2 million barrels. So I kept on thinking. All of which is to say, the numbers, while good, don't tell the whole story. All right, back in the saddle. Looks like, in addition to the usual brewery opening, the teams for some kind of basketball tourney were announced in my absence. Good to see life continues apace. I am falling behind again in my reviews, and so here are a couple of quickies. Lucky Lab in the Northeast? Although I have placed myself at some remove from the greater Beervana catchment area, satellites reach even my undisclosed location. And they send signals to my cell phone in the form of emails, on which, this morning, I heard a rumor that the Lucky Lab has added a new outpost. The rumor suggests Killingsworth and Concord. What the ...? American craft brewing is still mostly a first-generation industry. The owners and brewers who founded these companies still run them. In this way, the brands of craft breweries very closely resemble the personalities of the founders. The first two brand dissections, of Hopworks and Rogue, were selected for this reason. But today we consider MacTarnahan's, a brewery in arguably its third incarnation, managed by people far removed from the founders. MacTarnahan's was founded as Portland Brewing by Fred Bowman and Art Larrance, and occupied the building now owned by Rogue at NW 14th and Flanders. They didn't start putting beer out until 1986, but were busy setting up shop earlier than that--right at the dawn of craft brewing in Portland. At that time, trying to find money for breweries was like asking someone to bet on a sure bet in the third race at Portland Meadows. Art and Fred decided to approach this by getting a little money from a lot of people, so they sold shares Portland--a decision I think dictated how the company evolved. One of those people was Mac MacTarnahan, a businessman who offered $25,000 to get things started. To begin with, like other early breweries, things hummed along. Their first flagship was called Portland Ale, a pale that they started bottling around 1990/91. As the bottled products gained currency, they added Oregon Honey Beer and MacTarnahan's. For awhile it looked like the honey beer might become the flagship, but Mac's came into its own in the mid-90s. Around that time, Portland joined a bunch of breweries in expansion, building the new brewery and Tap Room in the early-mid 1990s. And, like a lot of breweries, they made a bad bet and the market for good beer dipped, leaving a lot of breweries stranded. Mac stepped in in 1998 and effectively bought the brewery. From there, Portland went through a series of buy-outs and mergers, acquiring Saxer/Nor'Wester in 2000. With those brands it became the 12th-largest brewery in the US, but the moment wouldn't last. In 2004, Pyramid acquired Mac's and in 2008, Magic Hat bought Pyramid. In the 1990s, Art left Portland and went on to found the Raccoon Lodge, and Fred left active management a few years later. Currently, MacTarnahan's, Pyramid, and Magic Hat are separate shops, with separate brewers and marketing departments. Mac's was spared complete integration, ironically enough, by the facility that weakened them a decade earlier--the brand continues to have a home in the brewery built to produce MacTarnahan's, and in fact is the brewery where all of Pyramid's Northwest-bound beer is brewed, too. Predictably, the changes at the brewery led to similar iterations of brand identity. In the first instance, Portland Brewing highlighted its Portland identity. As it began to grow into a regional company, it downplayed the city roots (Portland Ale was scuttled fairly early on--a loss only we old-timers had the chance to lament) and got into stylistic experimentation. The company made a fantastic German-style weizen that purportedly sold well in Chicago (but not here). They also did an Irish Ale, a lager, and an Oktoberfest--all useful in moving the brand beyond the city. When Mac came on-board, the company eventually abandoned these products and introduced a new line that focused directly on Mac's Scottish heritage--along with a new name for the brewery. These labels featured tartans and names like Blackwatch and Highlander, brands that survived until very recently. The next iteration came when the master-brewer, Alan Kornheuser, left for a year to manage Pabst operations in China. In his absence, head Brewer Brett Porter produced a series of the most distinctive beers the brewery has ever offered. They were based on beers he learned to brew at Gale's, a traditional brewery in England. For some reason, the brewery decided to go for garish, outlandish packaging in this period, culiminating in the psychedelic Bobby Dazzler. When Kornheuser returned, the beers did, too, and the line and brand identity continued to attenuate until the re-design in 2007. By the time of the re-design in 2007, MacTarnahan's was a receding brand. Pyramid has limited Mac's to sale in the Northwest, and so it made sense to return to to an identity focused on the city of Portland. Ironies abound: the brewery that abandoned the city so it could have a bigger market has returned to the city as a key branding strategy even while Portland--which has itself become branded as a beer town--is now recognizable far outside the Northwest. The re-brand was almost like starting fresh and getting back to basics. One of the brand's strengths is age, and this is echoed everywhere in the design: the classic font, suggestive of brands 50 years ago, the faux-rubber stamp on the label that reads "Portland's Original amber ale," and the stylized images of the copper kettles from the Tap Room, which themselves look antique. The design is intended to suggest solidity and age and associate the beer with Portland. Two other elements jump out. First is the thistle that the brewery started using when it switched to the MacTarnahan's name. This is yet another nod to the brewery's lineage and an homage to Mac MacTarnahan's wish to see his Scottishness represented. But it's also a clever way of tying the brand together, even in its 22s, which have a totally different stylistic signature. Second, the tagline on Mac's, "A distinct, well-hopped ale" is a subtle cue to beer geeks that the brewery is trying to make something other than a bland, middle-market beer. 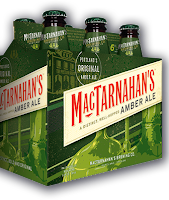 MacTarnahan's Amber anchors the brand (and in fact, it's the only regular beer left in the line-up; the rest are seasonals and special releases), but these elements are projected through the line. When I sat down with Mike Brown, president of Pyramid, last week, I asked about the bizarre characters on their seasonals, particularly the grifter and humbug'r. It started with Slingshot, he explained. They started with the kind of punky kid "mischievous," as per the label, and asked what became of him. Thus Grifter, the seedy character on their summer brand. Stylistically, these follow Mac's in the mode of nostalgia, with comic-book colors and images. "But Grifter, really? What were you thinking there?" I wanted to know. Mike was blunt--"To catch people's attention. We wanted it to stand out on the shelf." Essentially, the branding scheme here was exhibitionism. When these beers were coming out, I was mighty skeptical of this idea. It seemed to mock the very quality the brewery was trying to project. But Brown says it was quite successful. Apparently, within the riot of new brands, standing out has its virtue. Of course, the test will be this year, when consumers are familiar with the labels; it will be the beer that will bring them back in year two. I don't think you'd ever see a beer called "Grifter" from a brewery that saw the beer as an extention of themselves. It's hard to imagine Mac MacTarnahan signing off on that name. This is branding in a more traditional mode--the unemotional commodification of beer. As a good-beer fan, though, I ultimately care less about the theatrics involved in selling beer than I do in the beer itself. Breweries that try to put out a good product get a pass from me if they use crass means to sell them. In the last few years, the bigger changes with MacTarnahan's involve the introduction of an imperial stout, saison, and now a tripel. These beers have not yet scraped the sky like Dissident or Abyss in terms of accomplishment or daring, but they indicate a brand that's trying to compete with beer, not just spin. The brewery is anchored by MacTarnahan's a lovely little session, and trying to get bold with more aggressive beers. The brand identity, a mixture of the very traditional and a pulpy sensationalism, pretty well mirrors what's happening in the brewhouse. All in all, a brand in coherence. Nothing kills traffic as effectively as posts about beer distribution, but there's a case in Chicago I can't avoid. Before your eyes glaze over, read on--it's fascinating stuff! At issue was an effort by Anheuser-Busch Inbev (ABI) to buy a local distributor in Chicago. Following Prohibition, beer companies were required to sell to distributors who in turn sell to retailers--a "three-tiered" system designed to limit brewery dominance (backgrounder here). Things were humming along on the Chicago deal until it reached the Illinois Liquor Control Commission. The seven-member Illinois board ruled that Anheuser, as a company based outside the state, can't control a distributor in Illinois.... The commission said Anheuser—which is based in Leuven, Belgium—couldn't buy the 70% of City Beverage that it doesn't currently own, or it would revoke City Beverage's license to distribute beer in Chicago. City Beverage, which distributes the bulk of Anheuser's products in the Chicago metropolitan area, is part of Detroit-based Soave Enterprises. Anheuser and Soave were close to wrapping up the deal last month before the commission expressed concerns. Anheuser, the largest in the U.S. by sales, wants to own the Chicago distributor outright so it can improve its performance and make the brewer more competitive in the Windy City with MillerCoors LLC. MillerCoors, a joint venture of Molson Coors Brewing Co. and SABMiller PLC, is the nation's No. 2 brewer, but it has long led the Chicago market. I have lots of problems with the three-tier system, which generally hurts small breweries. But where it is clearly needed is in protecting competition among players in the market. I've written about how the tied-house system in England may be one of the reasons pubs are dying off in such stark numbers. Control of the American beer market is now down to just three major players (craft breweries, in total, command just a micro 4.3% of the market), and ABI wants to take an even larger piece of the pie. Congratulations to the Illinois Liquor Control Commission--rulings like theirs will make it harder for the Belgian giant to consolidate power. A slow day today, and I've been doing other things. However, I see Stan has linked to a list of BrewDog's favorite hops. This is interesting for a couple reasons: 1) Scottish brewers have not heretofore been noted for their hop passion, and 2) half are American. Bonus points for how they associate the different hops (positively, which goes to show that Scotland is a long way from Oregon) with Lady Gaga, David Hasselhoff, Spandau Ballet, Ziggy Stardust, Tony Christie [? ], and the Boss. You can decide how well these personalities align. 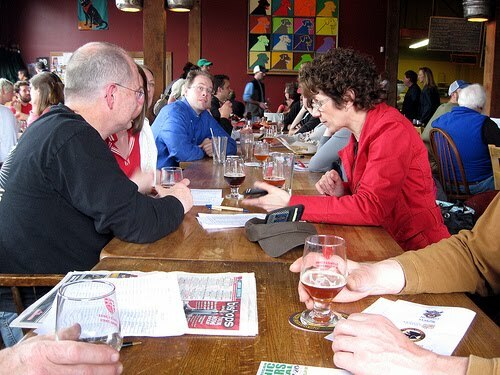 Next, Derek rather off-handedly selects his top ten Oregon breweries. Inclusions include Standing Stone and Big Horse, and exclusions include Full Sail, Pelican, Caldera, Ninkasi, Fort George, Widmer, Roots, Hopworks, and so on and so forth. His fave brewery? Hint: it's been open less than two years. Very bold! Personally, if you gave me a few more slots--say 35-40, I might play along. But ten? No way. You may go take issue with him there. Update: I should add--confess--I do like Lady Gaga. But I'd call her more of a Summit than a Simcoe. Craft breweries produced 9.1 million barrels, but still enjoy only a modest 4.3% of the total beer market. This is of course good news--and way better than the alternative. But looking at numbers in the aggregate conceals the performance of individual breweries--and based on murmurs I heard, there was substantial volatility. We'll get a fuller report in April, and then we'll have a better sense of how things are going. Update. As an example, Boston Beer missed its sales goals for the fourth quarter. Barrels sales dropped 14% in Q4 compared with the same quarter a year earlier. It's only one data point--but a pretty big one. Last week I went to the MacTarnahan's Taproom to chat with folks about new beers and brands. Mark Carver invited me out, and he may now be the longest-tenured guy left at Mac's. We were joined by Pyramid President Mike Brown and brewers Tom Bleigh and Vasilios Gletsos. 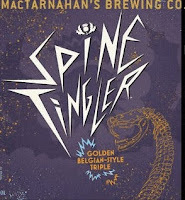 The featured beer was Mac's Spine Tingler, a tripel that will be released within days. But the real revelation came just before I left, two hours later. Mark plopped a MacTarnahan's in front of me. There are many cool things about writing about beer. Like sitting around drinking beer with brewers and brewery presidents. But there are some embarrassing moments, too, like the one I was about to experience. I sniffed deeply of the beer and was surprised at how vivid the hops were. Then I tasted it and was even more surprised. It was a totally different beer than the last time I tried it. "Have you changed the recipe?" I asked. "Not since we started dry-hopping it in 2001," Mark replied, mildly. It has apparently been that long since I've had a Mac's. (I never forget a beer--just the last time I had it.) MacTarnahan's was always a tasty beer, but understated and, as the decade of the 90s wore on, a bit underpowered as well. It went through a series of rebrands, becoming a "Scottish-style ale" for awhile (a nod to the namesake), and now calls itself a "distinct, well-hopped amber." I have always thought of the beer as perfectly characteristic for a brewery that prized consistency and drinkability above daring. Despite the now-anachronistic name ("ambers" emerged during a phase of American craft brewing when consumers didn't know how to relate to ales. To help them along, breweries named their darker pale ales "ambers" to bridge the gap between pales and browns.) Naming tradition aside, MacTarnahan's is a pretty classic pale ale (in fact, it won gold at the GABF in that category last year). One of the problems with writing about beer in the Northwest is that there are literally hundreds of new beers to try every year. I could easily try a new beer every time I went to the store or pub and never run out of options. As a result, I often fail to loop back around and try the old standards (a phenomenon I've Karl Ockert has called the "novelty curve"). It's been a long time since I've been out to the Tap Room, which is flanked by those beautiful copper vessels. If you have been similarly remiss, maybe it's time to take a trip out.